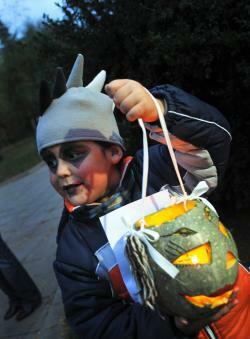 The Sandy effect: Should we postpone Halloween? To trick-or-treat or not to trick-or-treat? In my fair city of New Haven, our mayor says about Halloween, in the wake of Sandy, “I suggest that folks skip on trick-or-treating and stay home. I don’t see any reason why we should be bringing our kids out on the streets.” The mayor has the whole city to think about. In low-lying neighborhoods there is flooding, and nearly 200 trees are down along public streets, along with some number of live wires. One of those (neatly and promptly cordoned off by the police) is a block from us. But I have to say, I don’t want to postpone Halloween! It’s balmy outside, in the calm after the storm. I’m hearing from other parents whose kids, like mine, are itching to go. They’ve spent two days home from school, some houses don’t have power, and we could all use the diversion. Plus Halloween in our neighborhood is a community-wide pick me up. As in a lot of places, I think, a couple of streets deck themselves out in a bonanza of decorating and become ooh-and-ah Trick or Treat Central. People already drive in to candify from other parts of the city: I’m hoping the show goes on and we see even more of them this year. Our local alderman, Justin Elicker, has kindly given parents a lift (and earned the kid vote forever!) by recommending that we use our own judgment. New Jersey Governor Chris Christie is on the side of our mayor, though: “If conditions are not safe on Wednesday for trick or treating, I will sign an Executive Order rescheduling Halloween,” he tweeted Monday night. Towns along the New Jersey coast have already postponed, and suburban and shoreline towns in Connecticut may have good reason to as well, I’m learning from my Twitter feed. Surely some of this is eminently sensible, but I also think it’s one of those very fact bound questions: When precisely is it rational, based on the level of risk, to postpone trick-or-treating (or for that matter, close school), and when is it risk averse to the point of no-fun-ever over-caution? I’m not sure what the answer is, but I wonder how other towns are making this call, and what the criteria should be. Thoughts?